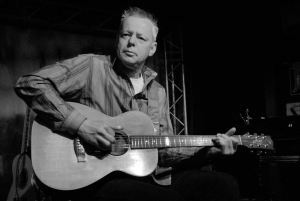 Tommy Emmanuel was part of the indoor programmation of the Montreal Jazz Festival, a great opportunity to record a video interview Guitar in Hand with this major musician of the fingerstyle community. Back in 2009, The Guitar Channel was then only an audio podcast, I have the opportunity to meet and interview Tommy at the New Morning in Paris. He was the very first major non-French speaking guitar player I had on the show. The archives from this encounter are still online in this list of articles.